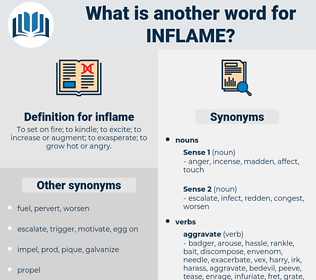 What is another word for inflame? To set on fire; to kindle; to excite; to increase or augment; to exasperate; to grow hot or angry. 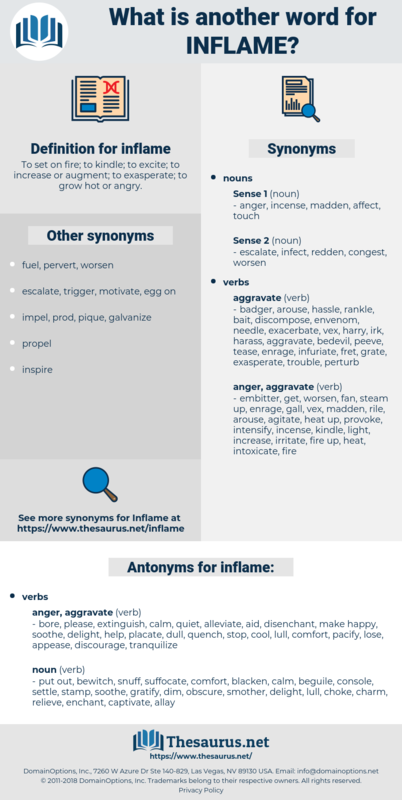 exacerbate, foment, aggravate, spark, worsen, heighten, instigate, fuel, escalate, intensify, provoke, stoke, deepen, stir, fan, kindle, incitement, reignite, erupt. bore, please, extinguish, calm, quiet, alleviate, aid, disenchant, make happy, soothe, delight, help, placate, dull, quench, stop, cool, lull, comfort, pacify, lose, appease, discourage, tranquilize. blacken, charm, darken, douse, settle, beguile, choke, captivate, gratify, obscure, allay, smother, enchant, dim, bewitch, relieve, snuff, put out, stamp, suffocate, console. On their second Sunday excursion he had actually driven her, despite her opposition, several miles on the Boston road; and her resistance only served to inflame him the more. My fear was to inflame your desire to leave home. decline, exacerbate, exasperate, aggravate, worsen.